We are excited to welcome you to the new look of Lucidchart! As we have added more functionality over the last couple of years, our users have told us that the user interface has become more complex and some features are hard to find. With this new look, we hope to improve Lucidchart by making it more organized and easy to use. First, we have introduced a standard Menu bar at the top of the page, and have moved some less commonly used features from the properties bar above the diagramming area to the new Menu bar. In addition, some more detailed controls have been organized into new Dock panels found along the right side of the Lucidchart editor. We recommend that you take a quick tour of the new interface by watching the video below. 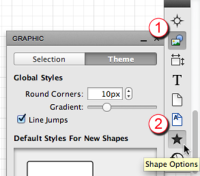 Use the new Theme tab in the Graphics panel to set document defaults -- shape color, line style, rounded corners, etc. -- rather than the properties bar. With this new design, your feedback is more important than ever! If you have questions, please check out our tutorials or feel free to contact us directly. This is just the start of exciting things to come in 2012 -- we hope you like the changes!